Recent events in Ferguson, Missouri put the issue of police militarization under the national spotlight. The shooting of 18-year-old Michael Brown, an unarmed black teenager, by a white police officer set off protests and rioting in the mostly black suburb of St. Louis. Images of local police confronting protestors with military-grade weaponry raised questions about what other local police departments had access to. In South Florida, the answer is a lot. Coral Gables Police Department, in particular, has received two mine-resistant vehicles, a tactical robot that can dispose of explosive ordinances and night-vision equipment within the past year. Local police departments procure this type of equipment through the U.S. Department of Defense’s Law Enforcement Supply Office Program (LESO). This program allows local law enforcement agencies to apply for and receive weapons, vehicles and equipment no longer being used by the U.S. military, with the aim of improving counter-terrorism and counter-drug efforts. The Coral Gables Police Department (CGPD) just received their equipment in the last few months, and so they cannot yet evaluate if it has helped counter-drug efforts, according to CGPD spokesperson Kelly Denham. Meanwhile, there have been no terrorism threats in the city this year, Denham said. According to CGPD, the mine-resistant vehicles they have received can be used for flood evacuations, post-disaster mobility and active shooter response. William Gerlach, the administrative lieutenant for UMPD, said that these weapons will not be used on campus unless necessary. “We do not have direct access to that equipment, but if we needed [CGPD’s] support in an emergency situation, I’m sure they would make those assets available to us,” he said. In other South Florida communities, the equipment received is much more extensive than that in Coral Gables. 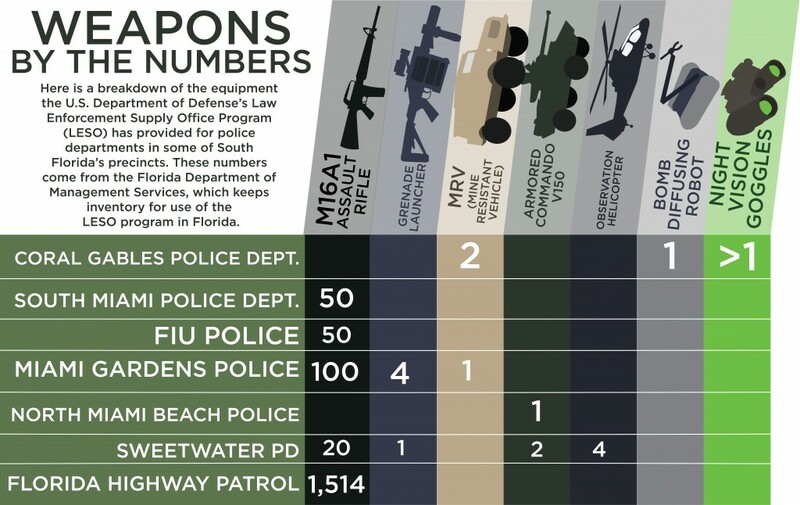 According to the Florida Department of Management Services, which keeps inventory for any use of the LESO program in Florida, the South Miami Police Department has access to 50 M16 assault rifles, which were first used by U.S. military forces in the Vietnam War and can fire hundreds of rounds per minute. Associate law professor Mary Anne Franks, who teaches classes on criminal law and procedure, sees these resources as a hindrance to public safety, rather than an asset. The idea of the police having access to this sort of weaponry makes some UM students apprehensive. “It’s kind of troubling that professionals who are not in the military are being armed with military-grade weaponry,” junior Kunal Chohan said. However, others believe the equipment can help police make a dangerous scenario safer. According to a list created and provided by the LESO that shows all equipment given to U.S. counties through the program since 2006, Miami-Dade County has received a similar number of M16 rifles as counties with similar populations, such as San Diego County, Philadelphia County, and Dallas County. Neighboring Broward County, with a population also within one million, has received no M16 rifles through the program. Other students seem to hold a similar perspective. “While I understand every community is vulnerable to some level of crime, giving the same weapons to local police as we do to our members of the military seems silly,” senior Chelsea Harrington said.